The folks at Get Me Off the Moon have launched a new campaign which calls for fans to send in art, letters, and tributes expressing appreciation and encouragement to the Mega Man 11 development team. GMOTM will then assemble all of your submissions into a physical fanbook that will be given to the development team at the San Diego Comic-Con. "As some of you may know, Capcom will be present at this year’s San Diego Comic Con to show off their latest games. While not all their plans are ironed out yet, we’ve received word that they’re looking into bringing some of the Mega Man 11 dev team to this event. If this ends up happening, we’d like to meet them in person and present them with a special gift on behalf of our group. We feel, after all, that these developers really deserve a warm welcome, and should be thanked for their services to the Mega Man community. Therefore, we'd like to ask you folks to send us encouraging messages and art for the MM11 dev team! We essentially want to make another fan book filled with pictures and notes that will boost the developers' morale and remind them that the entire Mega Man community is cheering them on! Once we’ve put together this fan book, the plan is to gift it to the Mega Man 11 team at SDCC; or, if we can’t do that, we’ll give it to the Capcom USA staff to give to the MM11 team. Whatever the case, you can be sure that this book will get in the hands of those developers! Anyway, we've prepared three main templates for submissions. Folks can choose whichever template they think will work best for their messages/art. For example, if you want to highlight your art more than your message, choose the "Art-Focused" form. If the reverse is the case, pick the "Letter-Focused" form. Or maybe you want to show off a bit of both your art and your writing. If that's the case, go with the "Multimedia" form! - All submitted images should be monochrome. This may seem like an odd choice, but we're going for an aesthetical style that resembles Splatoon Miiverse. - For the Art-Focused form, images must be 6" by 2", 300 DPI, less than 1 MB; message can be 500 characters total. - For the Letter-Focused form, no images are permitted; messages can be 1250 characters total. - For the Multimedia form, images must be 3" by 2", 300 DPI, less than 1 MB; messages can be 900 characters total. - All form submissions must be sent in before July 12 at 11:59pm PST (about three and a half weeks from now). And that's pretty much it! We look forward to your participation, everyone! Let's give the MM11 dev team a warm reception! Until next time, folks, keep fighting the good fight! Legends Never Die! What a neat thing to do, right? 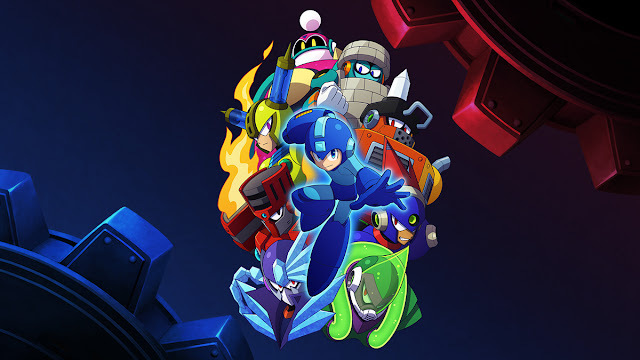 It's clear that an awful lot of love and care is going into Mega Man 11 and we, the fans, should really pull together to cheer 'em on. Please, please partiicipate! Even if you can't draw, write a little something-something up. Take no more than five minutes. The more stuff we can put together, the better. Well this is cool. I'm game. Definitely going to at least thank them for making what seemed like a dream deferred a reality. They seem like great people. Well, it's a nice idea. I'll give them that. Here's hoping they get enough submissions for a full book!